Today we have a little insect I collected in the wilds of my own bathroom. 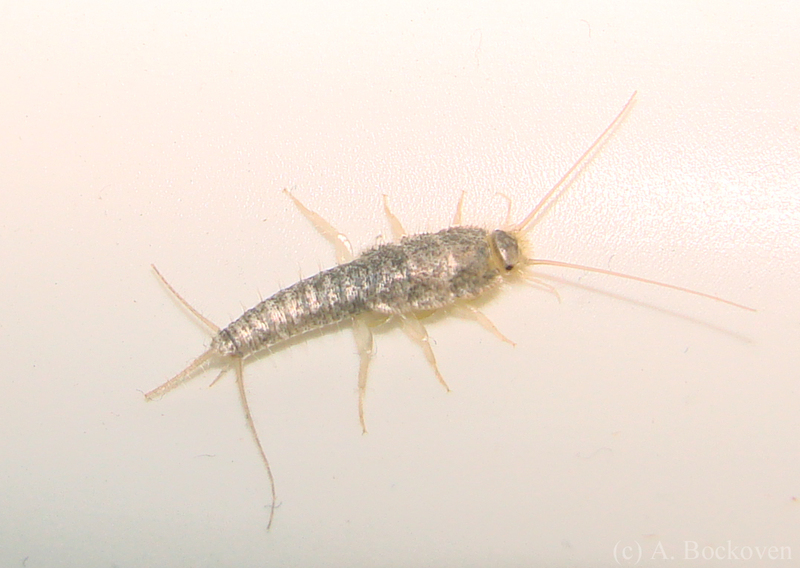 Silverfish belong to the order Thysanura, or “fringe tail”, which takes its name from the three caudal filaments which fan out from the abdomen. (This is distinct from members of Archaeognatha, which have three caudal filaments that extend in parallel from the abdomen.) 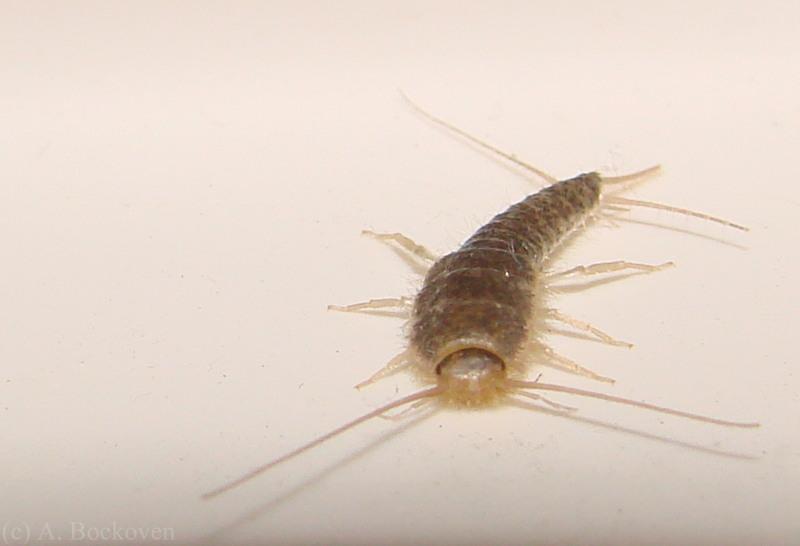 Silverfish enjoy cool, damp enviroments and starchy foods, making them common pests in bathrooms, basements and libraries. Although they do not bite or sting, they may do minor damage by nibbling on paper products, the glue of book bindings and wallpaper, and the starch in cotton or rayon fabrics. Outside of human homes they generally live in dead wood or leaf litter and eat lichens. Head on view of a silverfish's small lateral eyes and three caudal filaments. These little critters are impressively hardy: When I taught the introductory entomology lab a few semester ago I found a live silverfish living in a vial in the student collection. * The little silverfish had evidently been turned in several months before and had been surviving by devouring its own ID label. The caudal filaments of silverfish are delicate and break easily. *This is just one of many exciting and novel encounters I have had while overseeing student insect collections. One collection box I graded had a live wasp in a jar. 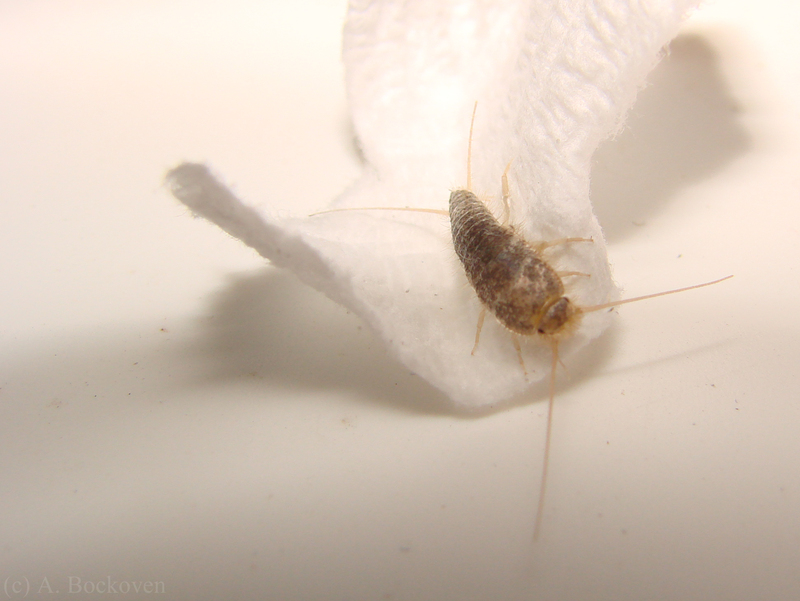 Interesting fact on silverfish: one of the few insects that can efficiently digest cellulose! Did you let it go?? The one in the picture went out the back door. The one in the vial was voted freedom by my students. Any suggestions on how to remove these pesky insects from my bathroom? They appear to had made a home in the wall by the bath, under the window. There’s also a fair number of them that come out at night and scarper when I switch the light on . I’ve just found one on my wall by the side of my bed, that looked really simillar to it, perhaps less silverish and more white, and had a sting on its back, and had blood inside. Do any of you know what is it? Thank you! I can’t think of any insect that has both a stinger and takes blood-meals.